This week I delivered a guest lecture to a postgraduate leadership class at the University of Canberra. I lectured on the importance of self-knowledge in becoming an effective leader, with a focus on Stoicism and journalling. The most common question I am asked when I lecture on this topic is: How do you journal? I began keeping a daily journal on 3rd December 2016. Since then, I have developed a simple formula that helps me to write, even when I don't feel like it. In this article, I outline the process and the resources I use when journalling. Marcus Aurelius kept a journal, and so did Seneca. The primary purpose of keeping a journal is to live the examined life (as espoused by Socrates) but also to "declutter the mind". Journalling is also central to the practice of Stoic philosophy. For the simplest overview of this philosophy, read the first paragraph of Epictetus' Enchiridion. This sounds simple enough, but to actually believe in the correctness of the philosophy requires daily practice. If one doesn't constantly remind oneself that what is good and bad is within us and we choose how we react to external events, it is easy to slip into old habits. 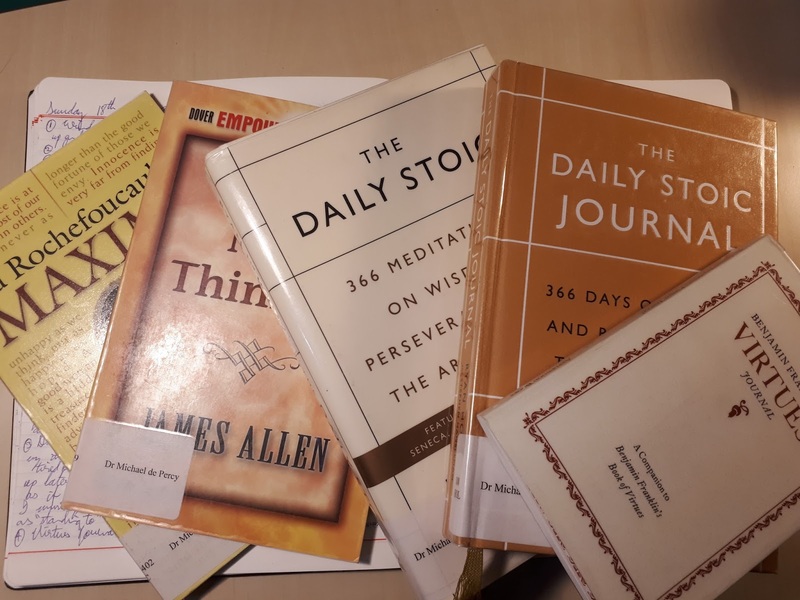 Journalling is a powerful tool to not only establish new habits, but to keep Stoic philosophy at the forefront of living. And what is the best time to write? Again, Aurelius wrote in the morning as part of his daily preparation, and Seneca wrote in the evening to reflect on the day that was, so I journal both in the morning and the evening. Keeping the discipline of journalling can be difficult, so there is some self-discipline involved. Research by James W. Pennebaker suggests that writing about and to oneself (as Aurelius did) can improve our mental health and well-being. But the proof is in the pudding: whenever I miss a morning session (which has happened twice), and even though I have "caught up" with my morning routine that same evening, I have found myself to flounder during the day. The reverse is not so true. If I miss an evening (which has also happened a couple of times, particularly when travelling), as long as I catch up the next morning, the effect is less drastic (although I do tend to forget some of the lessons learnt during the previous day). I had tried several times in the past to keep a journal, but the purpose always escaped me. My writing was directed by my mood, and I was often too tired to write anything meaningful. At the beginning of 2017, I purchased a copy of Ryan Holiday's The Daily Stoic and used the daily meditations as a prompt for my writing. This was simply a case of reading the daily meditation, then writing about the ideas or the quote or whatever else entered my mind. This led me to add a number of other daily prompts. I use three other books that provide prompts for my reflection and writing. The first work is Benjamin Franklin's Autobiography, where he outlines his thirteen-week virtues program. Franklin deliberately practised each of what he considered to be the thirteen key virtues, focusing on one each week, and leaving the rest to happen by chance. At the end of each day, Franklin assessed himself against each virtue, making a mark in a table against the virtue he had compromised that day. His idea was to complete four 13-week programs each year. Franklin was realistic, and accepted that humans can never be perfect. But self-improvement was the goal, and the daily process forces one to take stock of the daily practice of the thirteen virtues. Self-awareness is the greater part of the battle. The second work is La Rochefoucauld's Maxims. Although very witty and rather sarcastic at times, I enjoy the way La Rochefoucauld is realistic. His is not all positive thinking, but rather a reminder that we are human, and despite the best intentions, we can never be perfect. The third work is James Allen's (1921) collection of morning and evening meditations, As A Man Thinketh. Allen believed in the law of attraction: that we bring into our lives the things that we hope for (and the reverse). He meant we attract inward states, not a McMansion or a Lamborghini. But Allen also believed that we can control our own minds, and only through a process of self-analysis and self-examination and deliberate reflection, bit by bit, can we conquer ourselves (and therefore the universe). At the beginning and end of each session of journalling, I draw on Franklin's Virtues Journal and prepare myself for the day ahead, then assess my behaviour each evening. Again, one can never be perfect (as Franklin admitted), but it does provide a long-running record of behaviours and indicates rather clearly one's strengths and weaknesses. Reflection on the day ahead, and any thoughts that I "slept" on. La Rochefoucauld's Maxims. Usually, I write the maxim out in full. James Allen's morning thoughts. I usually summarise the key parts for the relevant day (there are 31 days with morning and evening thoughts, so it is a month long process). Ryan Holiday's The Daily Stoic. I summarise the key parts for each day (there are 366 meditations). Ryan Holiday's Daily Stoic Journal. There is a question relating to 4 above and I write in the journal in pencil. There is a short space for journalling in the morning and evening. Franklin's Virtues Journal. I ask myself "What good shall I do today?" Reflection on the day just gone, and any issues or lessons learnt. James Allen's evening thoughts. I summarise the key parts for the relevant day. The Daily Stoic Journal: I write in pencil against the day's question. Virtues Journal. I assess myself against the 13 virtues, place a black circle where I compromised the virtue, an open circle where I could improve for next time, and a tick when I feel I did the right thing, and a blank if there was nothing related to the virtue. It is difficult to assess oneself objectively, but the key thing for me is that I have developed an evidence base on my own thoughts, behaviours, and issues. Because it is my evidence, I have little choice but to accept it. This provides an important "mirror" in which I can see my behaviour more clearly. I suppose the process is a form of Cognitive Behavioural Therapy. But the process is my own, and I do enjoy it. While others may not notice an improvement in my behaviour, the benefits are importantly internal. As James Allen would say, we must fly to the "Rock of Refuge" which resides deep within our soul, and with our minds, we either forge weapons for our own destruction, or tools with which to quarry the mine of our soul. The point is to develop an "inner citadel" where we can be at peace, and all of our "possessions" reside. Not earthly possessions, but the possessions of our very soul. This is just one way of practising Stoic journalling, but it works for me. Even on the days when I have no clue what to write, I can read and reflect on the various texts. This usually becomes a trigger for personal reflection. But it must be daily. Seneca (I think it was) said something about how his entire philosophy was battered and bruised every time he left his house. It is only through morning and evening practice that I can stay true to the philosophy: to focus on what I can control, and be indifferent to external events, and to act right in response to the things that I cannot control. Daily journalling makes Stoicism work. It justifies why Ryan Holiday says "Journalling is Stoicism". And I think he is right.